Waking up from a great night’s sleep is always a glorious feeling. You feel well rested, awake, energized, and ready to start your day. Waking up from a poor night’s sleep is quite the opposite. Your back possibly hurts, you feel exhausted, and you may ache all over. If you have more mornings consisting of the second scenario, it may be time for a new mattress for your Newington home. At Mattress for LESS, we want you to always know how imperative sleep is to your everyday life. Even if only one thing is slightly off kilter, such as the pillow you’re using, your mattress is beginning to sag, or you are using the wrong mattress for the way you sleep, this can throw off your whole sleep equilibrium. Our mattress experts are here to help you find the perfect sleeping set up. We offer tons of firm and soft mattress, as well as headboards and some luxuriously comfortable pillows. Stop waking up feeling like a grump, and come get a new mattress from us today! In this post, we wanted to give you some telltale signs that it might be time for a new mattress. Experiencing issues with sagging, lumps in the bed, and memory foam not working correctly means it’s time to look into a new cloud of comfort. Once a mattress starts to sag, this causes less support which can increase pain in different parts of the body. To recognize a sagging mattress is quite simple; it will have an area that will be more sunken in than the rest of the mattress, and usually, this is right in the middle. Having a sagging mattress causes you to roll into the center, even if you don’t want to, as the mattress is pulling you to the sagging area. A sagging mattress can happen with any mattress material. With a spring mattress, the springs wear down over time; with a memory foam, the foam will become softer over time and the material will compress. While you may think you need to wait till the sagging becomes a serious issue, we recommend coming in when you suspect the first signs old faithful is sagging to the depths. Even an inch or two can throw off your whole sleep schedule. Don’t lose the support you need, come shop our mattresses in Newington. When memory foam hit the market scene, people were thrilled. This is a mattress that conforms to your body shape and will give you the best night of rest ever. Well, memory foam is a great option for a mattress, however, it is not invincible. Memory foam has sensors within the foam to remember your body shape and sleeping position. When you get up in the morning, the mattress should return to its normal state before you were in the bed. Over time, the fibers within the foam tend to break down and it becomes softer. This causes the mattress to not reform as easily as before. If you notice your body print in your mattress after you get home from work or your mattress is sinking in more than inch, come see the mattress experts. Get Your New Mattress Today! If you are experiencing any of these symptoms with your mattress, come see us in Newington today. At Mattress for LESS, we want to find you the greatest mattress at a truly affordable price. 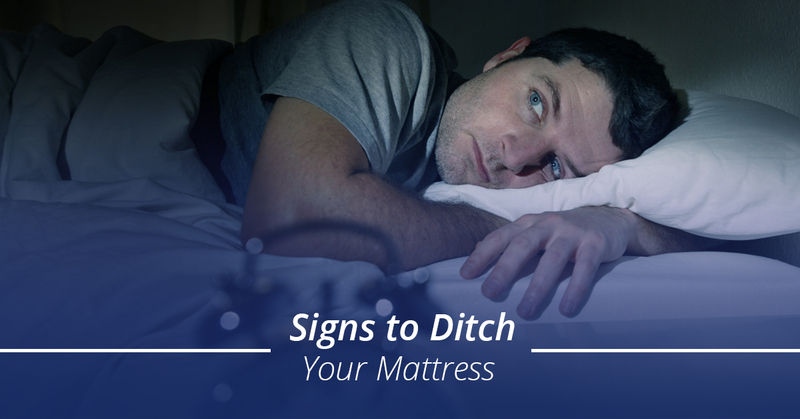 Check back for our next blog with more signs it might be time to ditch your mattress.